The best of Universal-International's followups to Abbott & Costello Meet Frankenstein, Abbott & Costello Meet the Invisible Man casts Bud and Lou as mail-order private eyes. The boys champion the cause of boxer Arthur Franz, who has been framed for murder. Utilizing the formula created by Claude Rains in the original Invisible Man (1933), Franz vanishes before Dr. Gavin Muir's astonished eyes. Cloaked by invisibility, Franz talks Bud and Lou into helping him nab the real murderer, gangster Sheldon Leonard. A string of uproarious gags and comic setpieces is highlighted by a boxing-ring finale, wherein Lou, backed up by the invisible Franz, dukes it out with a behemoth prizefighter. A clever special-effects closing gag caps this delightful A&C vehicle. Abbott and Costello Meet the Mummy is the last of the team's vehicles for Universal-International. Stranded in Egypt, Bud and Lou hire themselves out as travelling companions to archeologist Kurt Katch. Before long, Katch is murdered by a group of cultists, and a medallion, embossed with a map which leads to a sacred burial site, is accidentally swallowed by Costello. The boys become the unwilling pawns of the cultists, led by Richard Deacon, and a greedy adventuress, played by Marie Windsor. The last scene finds Costello being menaced by three mummies, two of them bogus. Garson Kanin's Broadway hit was transferred to the screen with only a few passing nods to the stricter censorship required by films. 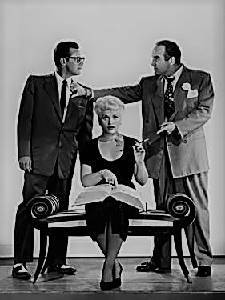 Judy Holliday won an Oscar for her portrayal of Billie Dawn, a strident, dim-bulbed ex-chorus girl who is the mistress of millionaire junk tycoon Harry Brock (Broderick Crawford). In Washington to put a few senators and congressmen in his pocket (the better to lay the groundwork for an illegal cartel), the rude-and-crude Brock realizes that the unrefined Billie will prove an embarrassment. Thus he hires idealistic but impoverished Paul Verrell (William Holden) to pump some intelligence and "class" into Billie. Paul does his job too well; by awakening Billie's social and political consciousness, he turns the girl into Brock's most formidable foe in his efforts to buy influence in DC. Along the way Paul and Billie fall in love. When Lucille Ball and Desi Arnaz beat the odds against TV stars succeeding on the big screen in The Long, Long Trailer (1954), MGM contracted America's favorite couple for a second theatrical feature. Forever Darling casts Desi as Lorenzo Xavier Vega, a brilliant scientist and Lucy as Susan, his neglected wife. Wishing out loud that her husband would pay attention to her, Susan is surprised to find her Guardian Angel standing in her living room. Even more surprising is the fact that said angel is an exact double for Susan's favorite movie star, James Mason. Following the angel's advice, Susan tags along when Lorenzo takes a trip in the woods to test out a revolutionary new insecticide. Hoping that the trip will constitute a second honeymoon, poor Susan is in for a major disappointment; as for Lorenzo, he must suffer his wife's well-intentioned "assistance," which of course is no help at all. After a number of I Love Lucy-style comic situations, the couple is on the verge of divorce, but the angelic Mason straightens things out. Forever Darling tanked at the box office, but at least Desi Arnaz cultivated a hit song by recording the title tune. Hot on the heels of such Red Skelton slapstick comedies as The Fuller Brush Man and The Yellow Cab Man came The Fuller Brush Girl, starring Lucille Ball in a fascinating dry run for her wacky "Lucy Ricardo" TV character. Unable to hold a job because of her tendency to get into trouble, Sally Elliot (Ball) hires on at the Fuller Brush company as a door-to-door cosmetics salesman. After several misadventures involving obnoxious children and snooty matrons, Sally finds herself in the middle of a murder scheme. With reluctant boyfriend Humphrey (Eddie Albert) in tow, Sally gets mixed up in one hilariously life-threatening situation after another, culminating in a prolonged chase sequence on board a tramp steamer. Highlights include Ball's outrageous striptease scene (to the tune of Rita Hayworth's "Put the Blame on Mame") and a choice cameo by Red Skelton as an all-too-cooperative customer. Most of the sight gags in Fuller Brush Girl were cooked up by former cartoon director Frank Tashlin, who'd also contributed to Fuller Brush Man. 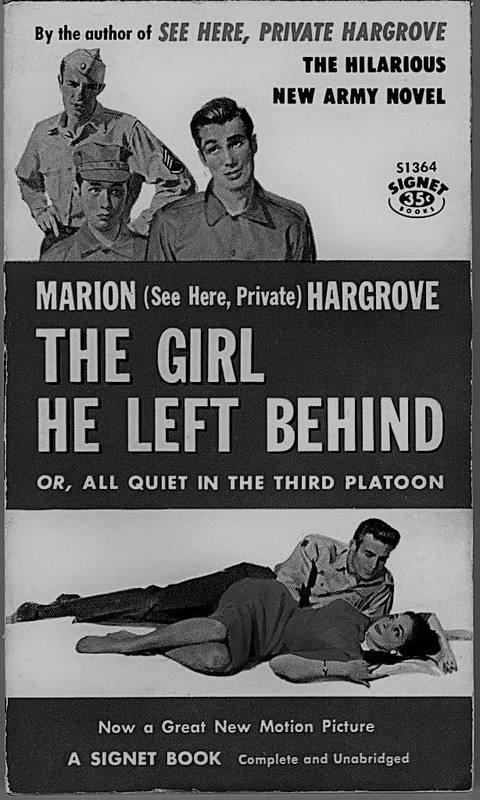 The peacetime draft is given the teen-idol treatment in The Girl He Left Behind. Hollywood hunk Tab Hunter is starred as a spoiled young man who is whipped into shape--and humility--by his two years of compulsory military service. Natalie Wood plays the girl who...well, look at the title. Director David Butler would have preferred to cast a minor actor who was making his film debut in the leading role, but Butler was committed to Warners contractee Tab Hunter. Thus it was that young James Garner would have to wait his turn. Fresh from radio and TV, "America's Favorite Family" stars in Here Come the Nelsons. That's right: this harmless little comedy is purely a vehicle for Ozzie, Harriet, David and Ricky. Since there must be a plot, the scriptwriters contrive to have Harriet uncharacteristically express jealousy over the presence of Ozzie's former schoolmate Barbara Schutzendorf (Barbara Lawrence). Meanwhile, Ozzie seethes when handsome young Charlie Jones (Rock Hudson) pays a bit too much attention to Harriet. To prove that he's still got what it takes, Ozzie competes against Charlie in a rodeo held in honor of the town's centennial (this sort of plot device usually happened to David or Ricky on the TV show). For no reason other than there are extra reels to go, little Ricky is kidnapped by a pair of bank robbers, played by Sheldon Leonard and Ed Max. Here Come the Nelsons was directed by Frederick De Cordova, whose other credits for Universal included such deathless entries as Bedtime for Bonzo. The Jackpot is a generally pleasing satire of quiz programs. James Stewart stars as Bill Lawrence, an average Joe who picks up the phone one day, answers a simple question, and suddenly finds himself the recipient of a radio quiz-show jackpot. Tons of prizes are shipped to Lawrence's house, to the delight of his wife Amy (Barbara Hale) and his kids. Unfortunately, the Lawrences must now contend with the income tax folks, who levy huge tariffs on their "free" prizes. Complications begin piling up with dizzying rapidity, resulting in a night in the hoosegow for the befuddled Mr. Lawrence. Featured in The Jackpot as the Lawrence children are a couple of stars-in-the-making: Natalie Wood and Tommy Rettig. The Law and the Lady is the third film version of the venerable Frederick Lonsdale stage play The Last of Mrs. Cheyney. Greer Garson follows in the footsteps of Norma Shearer and Joan Crawford as a beautiful confidence trickster, working in concert with a suave jewel thief (Michael Wilding). Jane Hoskins (Garson) inveigles herself into the household of San Francisco dowager Warton (Marjorie Main), where she and her accomplice intend to take their feisty hostess for everything she's got. Thanks to censorial intervention, many of the sharper satirical edges of the Lonsdale original have been dulled by sentiment and pathos. Still, any film that offers Greer Garson as a not-so-nice lady is well worth having. Based on a true story, Mister 880 is the whimsical tale of an elderly gentleman (Edmund Gwenn) who dabbles in counterfeiting. He makes only enough "funny money" to support himself, but the fact that his work is so amateurish (he can't even spell "Washington") arouses the indignation of the treasury department. Burt Lancaster, the hard-nosed treasury agent put on the case, is determined to prosecute the miscreant to the full extent of the law. In tracking down a lead, Lancaster falls in love with Dorothy McGuire, a recipient of one of the phony bills. Lancaster discovers that McGuire lives in the same building as Gwenn, and after piecing together the clues arrests the old fellow. Softened by Gwenn's naivete, Lancaster and Ms. McGuire arrange for a compassionate lawyer to lessen what would otherwise be a stiff prison sentence. Mister 880 was to have starred Walter Huston as the ingenuous counterfeiter, but Huston died just before filming started. Henry Fonda returned to films after an eight-year absence in this masterful adaptation of the actor's Broadway hit Mister Roberts. Written and partially directed by Joshua Logan, the film stars Fonda as Lt. Doug Roberts, chief cargo officer of the supply ship "Reluctant." WW2 is in its last few months, and Roberts is itching for combat duty. But the Reluctant's surly, despotic captain (James Cagney), anxious to use Roberts to expedite his own promotion, refuses to sign any of Roberts' transfer requests. Helping to brighten Mister Roberts' humdrum existence are his best friends, Ensign Frank Pulver (Jack Lemmon, in an Oscar-winning performance) and the ship's philosophical doctor (William Powell, in his final film appearance). Most of the laughs are provided by Pulver, officer "in charge of laundry and morale." When he isn't wheeling and dealing to bring a bevy of beautiful nurses on board the Reluctant, Pulver is concocting elaborate schemes to avenge himself against the Captain -- even though he's spent 14 months on the Reluctant without ever meeting his nemesis. The film's highlights include the efforts by Roberts, Pulver, and Doc to mix a bottle of Scotch from Coca-Cola, Iodine, and other vital ingredients; and Mister Roberts' (and later Ensign Pulver's) assertion of manhood by tossing the Captain's precious palm tree overboard. Halfway through shooting, legendary director John Ford was replaced, ostensibly because of illness, by Mervyn LeRoy. One of the finest service comedies ever made, Mister Roberts spawned a less amusing sequel, Ensign Pulver (1964), as well as a 1965 TV sitcom. Robert Jordan is a television star. Robert Jordan likes things orderly, on time and properly executed. In his world children are to be seen, not heard. So why would Mr. Jordan want to become the master of a rambunctious band of Boy Scouts? Ratings. His staff figures that if learns how to interact with the youth, they will be more inclined to watch his show. Of course watching Jordan cope comprises most of the fun. Yes, that's Vincent Edwards under that lavish blonde hairpiece in Eagle-Lion's Mr. Universe. An unsubtle lampoon of professional wrestling, the film top-bills Jack Carson as manager Jeff Clayton, who convinces bodybuilding contest winner Tommy Tomkins (Edwards) that "you gotta have a gimmick." Tommy rises to fame in the wrestling ring as a Gorgeous George clone, while Clayton tries to pay equal attention to his faithful girlfriend Lorraine (Janis Paige) and to extortion-prone gangster Fingers Maroni (Robert Alda). After several fixed bouts, Tommy shows he's really got what it takes in an honest grappling match. Just in case anyone might take this thing seriously, Bert Lahr shows up as wrestling promoter Joe Pulaski. Also on hand are famed ringside announcer Dennis James ("Okay, mother! "), former boxing champ Maxie Rosenbloom, and radio tenor Donald Novis. Something for everybody! In their never-ending efforts to create a movie series to match the success of "The Thin Man," MGM came up with the fast-paced programmer Mrs. O'Malley and Mr. Malone. Based on characters created by Craig Rice, the film stars James Whitmore as lawyer and part-time sleuth John J. Malone (this character had previously appeared in several other films, as well as the radio series The Amazing Mr. Malone). In his efforts to track down an embezzler, Mr. Malone boards a train heading for New York. Meanwhile, Mrs. Hattie O'Malley (Marjorie Main), a raucous widow from Montana, is also travelling to New York to claim her prize money from a radio contest. During the journey eastward, the man whom Malone is seeking ends up dead. Thanks to Mrs. O'Malley's well-intentioned interference, Malone ends up being accused of murder. How this mismatched pair manages to solve the mystery and save their own hides is good for several laughs. Mrs. O'Malley and Mr. Malone didn't result in a series, though James Whitmore and Marjorie Main make a surprisingly copacetic screen team. In this comedy, an auto mechanic and a horse trainer successfully steal $30,000 from a bank and squander it. They buy a race horse with the remainder, but need money to train it, so they rob another bank and are caught this time. The bank takes over ownership of the horse, which becomes a big winner. Like thousands of other Manhattanites, Tom Ewell annually packs his wife (Evelyn Keyes) and children off to summer vacation, staying behind to work at the office. This particular summer, the lonely Ewell begins fantasizing about the many women he'd foresworn upon getting married (in one of the fantasies, Ewell and Marguerite Chapman parody the beach rendezvous in From Here to Eternity). He is jolted back to reality when he meets his new neighbor--luscious model Marilyn Monroe. Inviting Monroe to dinner, Ewell intends to sweep her off her feet and into the boudoir. Things don't quite work out that way, thanks to Ewell's clumsiness (and essential decency) and Monroe's naivete. Still, Ewell becomes convinced that his impure thoughts will somehow be transmitted to his vacationing wife and to the rest of the world, leaving him wide open for scandal and ruination. In the original play, the husband and the next-door neighbor did have an affair, but both play and film arrived at the same happy ending, with Ewell and his missus contentedly reunited at summer's end. Featured in the cast of The Seven Year Itch are Robert Strauss as a lascivious handyman, Sonny Tufts as Evelyn Keye's former beau, Donald MacBride as Ewell's glad-handing boss, and veteran Broadway funny man Victor Moore in a cameo as a nervous plumber. The launching pad for Billy Wilder's comedy classic was a rusty old German farce, Fanfares of Love, whose two main characters were male musicians so desperate to get a job that they disguise themselves as women and play with an all-girl band in gangster-dominated 1929 Chicago. In this version, musicians Joe (Tony Curtis) and Jerry (Jack Lemmon) lose their jobs when a speakeasy owned by mob boss Spats Columbo (George Raft) is raided by prohibition agent Mulligan (Pat O'Brien). Several weeks later, on February 14th, Joe and Jerry get a job perfroming in Urbana and end up witnessing a gangland massacre in a parking garage. Fearing that they will be next on the mobsters' hit lists, Joe devises an ingenious plan for disguising their identities. Soon they are all dolled up and performing as Josephine and Daphne in Sweet Sue's all-girl orchestra. En route to Florida by train with Sweet Sue's band, the boys (girls?) make the acquaintance of Sue's lead singer Sugar Kane (Marilyn Monroe, in what may be her best performance). Joe and Jerry immediately fall in love, though of course their new feminine identities prevent them from acting on their desires. Still, they are determined to woo her, and they enact an elaborate series of gender-bending ruses complicated by the fact that flirtatious millionaire Osgood Fielding (Joe E. Brown) has fallen in love with "Daphne." The plot gets even thicker when Spats Columbo and his boys show up in Florida. 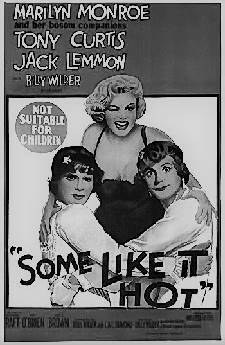 Nominated for several Oscars, Some Like It Hot ended up the biggest moneymaking comedy up to 1959. Full of hilarious set pieces and movie in-jokes, it has not tarnished with time and in fact seems to get better with each passing year, as its cross-dressing humor keeps it only more and more up-to-date. This seminal Brady Bunch stars Van Heflin as a widower and Patricia Neal as a widow. Both parties have several children by their first marriages. Heflin and Neal fall in love and decide to marry, each hoping to adopt the other's kids. The couple idealistically subscribes to the "one big happy family" theory, but they hadn't figured that their kids would dislike the idea...and each other. This mild situation comedy was directed with lots of efficiency but little style by Douglas Sirk, who did better for himself with Universal's big-budget romantic melodramas of the mid-1950s. In this subtle 1954 comedy with feminist overtones, Clifton Webb plays Gifford, an executive with a large automobile manufacturer who is having trouble deciding who to hire as his chief sales manager. His three candidates are equally competent, so he brings their wives with them to New York headquarters, planning to hire the one whose wife is most suited to be an executive's wife. Elizabeth (Lauren Bacall) is the wife of Sid (Fred MacMurray), a company man. Elizabeth knows that Sid is such a workaholic that she will never see him if he gets the new job, but she is loyal to her husband and impresses the hiring team with her competency. Bill Baxter (Cornel Wilde) is handicapped in the competition by his wife Katie (June Allyson), a clumsy but sweet small-town girl from the Midwest. Katie dutifully tries to impress the big boss but proves inept at handling the social responsibilities. She would prefer to stay in Kansas City anyway. Jerry (Van Heflin) is married to Carol (Arlene Dahl), a seductive gold-digger who sexually teases various executives in the hopes that her assets can help land Jerry the job. Instead, her out-of-bounds behavior gets Jerry eliminated from the list, at least until Jerry tells Gifford that he doesn't sanction his wife's behavior. 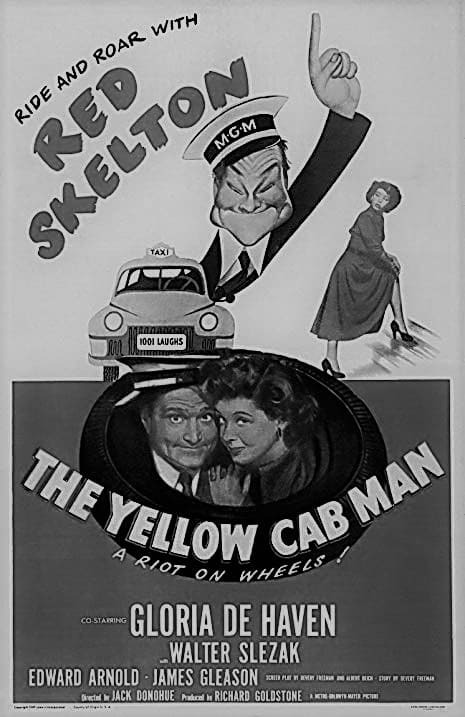 Obviously inspired by the success of Red Skelton's The Fuller Brush Man, The Yellow Cab Man stars Skelton as a Rube Goldberg-type inventor who can't seem to stay out of trouble. He also can't hold down a job, either, much to the consternation of girl friend Gloria De Haven. Through the auspices of cab driver James Gleason, Red is hired by the Yellow Cab company, nearly losing his job on the very first day when he gets mixed up in a chaotic wedding reception (in her last feature film appearance, Polly Moran is screamingly funny as the bride's mother). It's all over for Red when he attempts to demonstrate his latest invention, break-proof glass-resulting in a bad bop on the noggin for boss Paul Harvey. Our hero redeems himself by capturing a gang of crooks (among them Walter Slezak and Ray Collins) in an elaborate slapstick finale involving a revolving model home, a hypodermic-shooting toaster, a helium-filled balloon, and a Tarzan-like swing from the rafters of an empty warehouse. Halfway through The Yellow Cab Man, there's an amusing precursor to the "LSD Trip" films of the 1960s, as a drug-benumbed Red Skelton experiences a series of surrealistic dreams.